Our extensive range of tungsten carbide rings are available with a choice of coloured carbon fibre inlays, all set off with a highly polished finish. Our 8mm black carbon fibre tungsten ring is our most popular men's ring and now has a women's matching 5mm version. 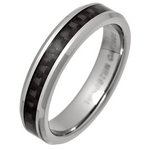 Our carbon fibre inlay tungsten rings are available in UK sizes J to Z+6 from stock. Our Tungsten Rings with Carbon Fibre Inlays have been rated 10 out of 10 based upon more than 29 customer reviews.